In Key West bicycle rental at our 5 convenient locations, best price! Free helmets, free locks with chains, battery ﻿free﻿ automated solar bike lights, bell on bike, baskets on bikes, all free! ​Rent tandem bikes, 3 wheel adult trikes, kids bikes, fat tire cruisers, bicycles with attached child seats, more choices for adults, families and children. Multi day rental and group discounts. Check our bicycle options and low cost best prices for bike rentals in Key West! Rent tandems, 3 wheel bikes, conch cruiser bikes, bicycles for kids, more! Key West Bicycles for rent year round! Multiple locations, convenient for everyone. as well as guests of the luxury resorts we serve. Our bike rental locations open to everybody! ​We are at top Key West resorts for good reasons... top quality bikes, equipment and our bike repair crews servicing the rental bikes daily. Call today for group discounts, with quality service and safety! Expert bicycle maintenance and safe, reliable bike rentals for families, for locals, for tourists and travelers. Biking is one of the best ways to get around in Key West, FL. Key West cruisers are a convenient travel option. Key West Bicycles are a great method of transportation for the whole family. There aren't really bike trails, but it's an easy bike tour through this scenic flat island surrounded by the Atlantic and Gulf of Mexico. Easy to park, earth friendly and one of the best ways to get around on the island, we have many unique Key West bicycling choices. Biking in Key West is fun for everyone and an affordable and inexpensive way for getting around Key West! Rent bikes in Key West FL, Bike Rentals at the Casa Marina Resort at Coconut beach, near corner of Alberta and Simonton St., Are you in town on a cruise ship? We have bicycle rental near Key West cruise port. Rent for a day Key West Cruisers bike rental, for children rent bikes in Key West Florida with baby seats or trailer totes. Explore old town, Mallory Square, the southern most point, and more. Intense cycling enthusiasts, rent fat tire bikes for bicycling Key West and the upper Florida keys. Try something more unique and maybe suited for you, our adult trikes three wheel bicycle rental in key west Florida, or try specialty types/ tandems for two person riding - cycling in Key West. Bike Rentals at The Reach Resort. Bikeman in Key West has more locations, Bikes at Red Doors Gallery, at Sunshine on Duval St. and Sunshine on N. Roosevelt Blvd. 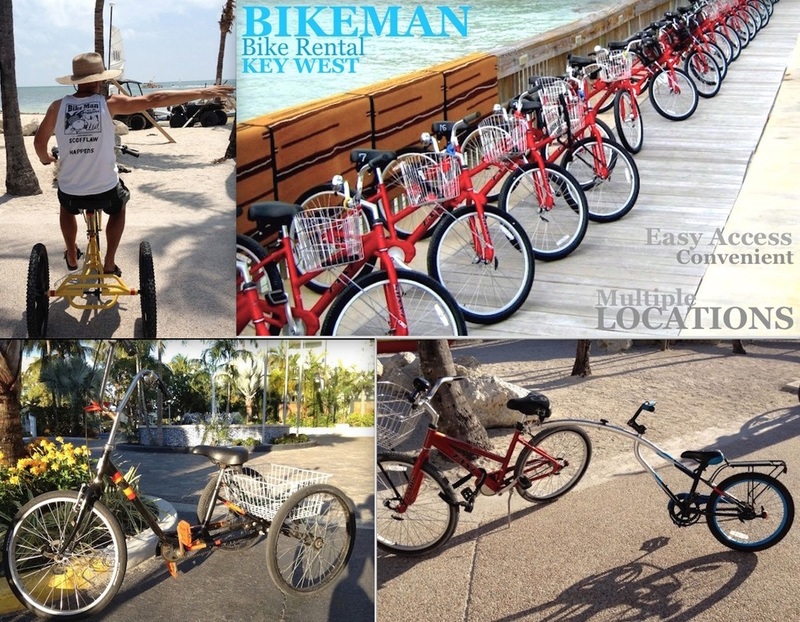 ​More about Bike Man Bike Rentals Key West owner Tom Theisen. Key West Bike Man rents tennis rackets. Rent tennis rackets in Key West Florida and see the list of free public tennis courts on our page link. Bikeman has pickleball too! Our bicycle crews service the bikes everyday. At Bike Man Bike Rentals Key West FL, we have several island locations, but the main address is 310 Duval St. Key West, FL 33040 At The Sunshine Duval location. ​Map for - Bike Man Bike Rentals in Key West. You can count on us! Thank you.